Any experienced car buyer will tell you that research is an essential part of a successful shopping journey. Luckily, the team at Volkswagen Lee’s Summit has made that even easier for drivers near Lee’s Summit, North Town, and Overland Park by providing you with this library of VW Jetta Reviews. Within these pages, you’ll find out more about the key features and capabilities of this redesigned ride. 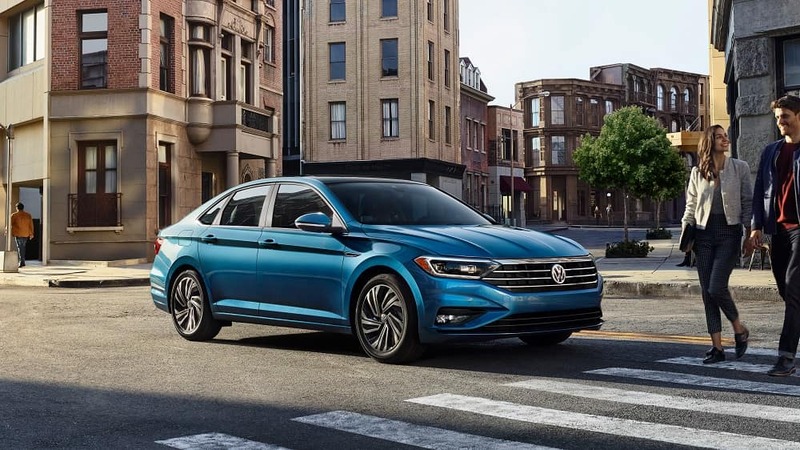 Thanks to these Volkswagen Jetta reviews, you’ll arrive at our dealership knowing that this sporty sedan is ideal for your commutes near Mission and Olathe. Let’s take a look! Every journey you take should be equipped with advanced technologies that help you stay connected to your favorite music and applications. To learn more about the high-tech gadgets tucked into the cabin of this agile sedan, check out our reviews of the Volkswagen Jetta below! No matter which trim of the VW Jetta you choose, you’ll be armed with the standard 1.4-liter turbo engine, which serves up 147 horsepower and 184 lb-ft of torque. In addition, a 6-speed transmission comes standard and harnesses all that strength. If you’re looking for an automatic transmission, this sedan offers an available 8-speed system with Sport Mode. That way, you can toggle between normal driving and a sport-tuned adventure with the touch of a button. Don’t forget to take a peek at this car’s Driving Mode Selection system and other features by reading our VW Jetta reviews. It’s always important to keep up appearances. And, inside the stylish Volkswagen Jetta interior, you’ll be surrounded by comforting materials and eye-catching accents. For example, optional leather upholstery adds a touch of luxury to the interior. Meanwhile, the available customizable ambient lighting system presents ten color options that’ll bathe the cabin in your favorite hues. With this tool, there’ll be no denying that your VW Jetta is styled to fit your unique personality. Take a look at the other soothing materials and conveniences found in this road cruiser by clicking on our reviews of the Volkswagen Jetta. Discover More About the VW Jetta Today! At Volkswagen Lee’s Summit, we want to help you make the most of your adventures near Lee’s Summit, North Town, and Overland Park by arming you with a dependable vehicle. And, with the Volkswagen Jetta as your next sidekick, nothing will stop you from claiming your spot at the head of the pack on the highways of Mission and Olathe. Of course, you’re probably eager to learn more about the technologies and amenities included inside this automobile. To do exactly that, click on one of our VW Jetta reviews and start reading!